Is it real old cobblestone? It looks antique, but it's not. It's Unilock's Antique Cobble. Design your way into the old days. A new paver with an old look. The irregular shape of Brussels Block has an antiqued appearance resembling an old cobblestone which allows you to create either a stone terrace, a courtyard, or a winding pathway achieving an attractive transition from house to garden. 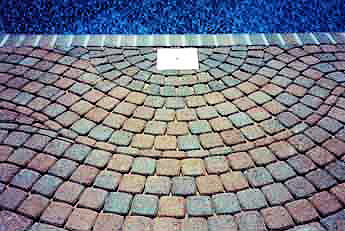 You may introduce grass, moss or colored stone chips between the pavers creating contrast and interest. Whether your look is a French Chateau, a Victorian garden or just casual country living - Brussels Block is the perfect choice today. Camelot Stone imparts classic, European elegance to paved areas with its Old World surface texture and design. Named after King Arthur's Court, Camelot Stone offers designers, architects and builders unlimited design possibilities. Camelot Stone provides maintenance free durability and long lasting beauty to paving projects. The nostalgic, natural stone look of the rectangular and square pavers can be used in various combinations to obtain an array of exciting pattern designs for pedestrian or vehicular applications. Cortina's textured surface, although uniform in size for ease of installation, provides a natural stone appearance. 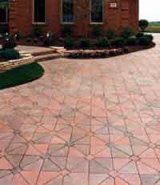 Double Holland, when used on its own, naturally creates a traditional patio design. Double Holland is part of the Holland Plus System, giving it virtually limitless design potential. Its size is also a benefit that relieves you of any back-breaking installations that traditional patio stones result in. Double Holland is a natural choice for patios, walkways, pool decks and driveways. 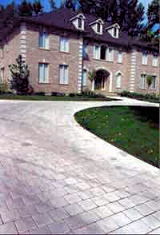 Holland Edge, from its name, was initially manufactured as an edging paver for the Holland Plus System. Since its design, Holland Edge's function has become two-fold. An exciting new pattern called Sunburst was developed, giving you yet another distinct look to choose from. Its versatility is widely used in both residential, commercial and industrial applications. Hollandstone has the renowned durability of Unilock interlocking paving stones yet offers the Old World charm of a simple brick shape in paving. A dry cast paving stone so astonishingly simple in design yet capable of meeting the demands of architects and interior designers for beautiful yet everlasting textured paving surface. This simple rectangular stone can be applied in a number of fascinating patterns to produce warm, luxurious textures. The Olde Greenwich Cobble harkens back to earlier days when the streets were paved with handmade granite cobbles. The small components allow for an infinite variety of circular, curved and random patterns, all with that Old World charm. Uni-Decor is especially attractive because it combines two different but compatible shapes of paving stones. The successful marriage of these two shapes in an interlocking paving stone system presents a paving texture that, while modern in execution, is timeless in its appearance. As a heavy duty interlocking retaining wall system, Dura-Hold is ideally suited for industrial and commercial landscaping, erosion control, protective facing and waterfront treatments. Dura-Hold face units and tiebacks produce the correct batter automatically to form a combination gravity and semi crib wall to a maximum height of 25 ft. If the site conditions are satisfactory, no footings are required. Tiebacks are aligned vertically in alternate courses in 8 ft centers. Under normal soil conditions, walls under 8 feet do not need tiebacks. 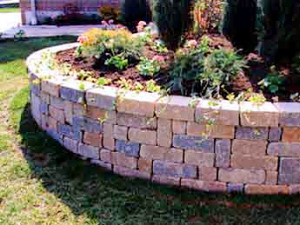 Retaining walls built with Pisa Stone lean at the proper angle to assure stability. 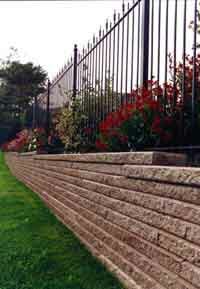 This slope is formed automatically by the patented off-set interlock. A pad of compacted gravel in a shallow trench is all that is required for a Pisa Stone wall up to 4 feet in height. No other foundation is required. Blocks are simply laid dry, without mortar, one on another. A coping stone, also interlocked, provides a finished top. Modular units interlock with built-in setback and automatically form correct slope. Pre-cast concrete units can be butted tight or placed with spacing for plant growth. Pisa II is supplied in rectangular as well as wedge-shaped units. The wedges, when placed together, help to form curved walls with continuous tight fit. Units can be placed around inside curves with spaces left at the rear being filled with granular draining material. Staggered blocks in successive courses maintain the interlock. 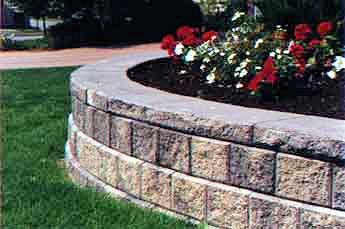 Coping - A straight wall is capped with Pisa Stone coping. Various degrees of curve can be accommodated by using Reverse-a-Cap coping. All coping for Pisa II walls must be secured with a butyl tape or Paver Bond adhesive. A distinctive new element in the Pisa II system is Roman Pisa. These easy, ready-to-use units have the same adaptations and shapes as the Pisa II, but are enhanced by an antiquing process that distresses and naturalizes the unit. 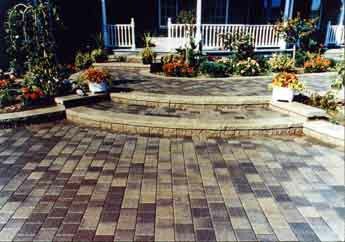 The end result is a look reminiscent of the "weathered" appearance that is so popular in today's landscaping. A new element of the Brussels System is Brussels Dimensional Stone. 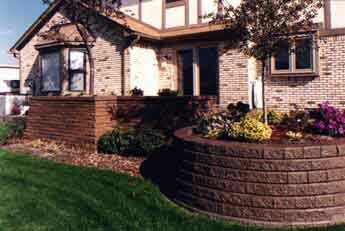 These highly adaptable units can be built as a planter wall, utilized as an edge restraint, or used as steps. It's also an outstanding choice for use as a heavy duty paving stone. Its style and ease of handling makes it an exceptional selection, either on its own or in combination with other Unilock systems.